Housed in Singapore's oldest home-bred departmental store TANGS, is a five-star luxury hotel that is strategically located in arguably the best location on Orchard Road. The Singapore Marriott Tang Plaza Hotel is directly above Orchard MRT Station and is accessible via sheltered and underground walkways so you do not have to worry about the sweltering heat or the intermittent rains that happen every now and then. Click HERE to book the Singapore Marriott Tang Plaza Hotel! With ten different room and suite types, the Singapore Marriott Tang Plaza Hotel catered traditionally to business and luxury travellers but it is slowly transforming into a staycation hotel for residents of Singapore too. Boasting five-star comfort and plush beddings, the Singapore Marriott Tang Plaza Hotel has various deals and packages which cater to the different leisure and business needs. Marriott will match any comparable competitors' prices and discount that rate by an additional 25% so it can be a good idea to book directly with Marriott. I arrived at the Singapore Marriott Tang Plaza Hotel early so I decided to have lunch at Pool Grill restaurant which is next to the beautiful swimming pool. It is a shame I did not actually get to swim in the pool since it was pouring the next morning when I wanted to. Pool Grill offers a pretty good set lunch for only S$30.50++ (approx. S$36 after taxes) which comes with a starter, main course, dessert and iced (or hot) coffee/tea. This is definitely one of the more affordable hotel set lunches in the vicinity of Orchard Road so do consider the Pool Grill the next time you are looking for a business lunch destination. I stayed in an Executive Room at the Singapore Marriott Tang Plaza Hotel and was given a room on a high floor, boasting impressive views of the famous Orchard Road and iconic shopping centres in the area. Executive Rooms range from 32 to 34 sqm and they are located on the higher floors to give hotel guests a good view of the surroundings. More importantly, Executive Rooms come with Executive Lounge access where you are able to enjoy complimentary breakfast, evening drinks and canapés on top of light snacks and beverages throughout the day. Some Executive Rooms have connecting rooms should you require them - be sure to let the hotel know as early as possible. My bed came with a mix of six European and regular pillows that I am comfortable with. If you require more or different pillows, you may pick from a Pillow Menu which is located by the bedside table. There is also a small sitting area in front of the bed for you to eat while watching TV or simply to do your work in front of the television - not the most productive thing to do though. The room comes with an extensive and well stocked minibar, a small work desk with two chairs, an iron and an ironing board, a 46" LCD TV and a sizeable marble bathroom. The minibar is definitely one of the most well-stocked one I have ever seen in a hotel. While the Singapore Marriott Hotel offers convenience to those who do not wish to leave their rooms (i.e. the business travellers), it is worth noting that some of these prices can be quite high. It might be a better idea to get some room service instead of snacking on some chocolate bars if you are hungry and unwilling to step out of the hotel. I received a small fruit platter, two complimentary bottles of Evian and a handwritten card as welcome amenities for the stay. The fruit platter however did not impress me as the grapes were starting to go bad - first time experiencing this in a five-star hotel! The handwritten card was however a nice touch. Even though the bathroom does not come with a bathtub (which is quite a disappointment), the marble interiors exude an air of luxury and indulgence. The lighted makeup mirror and rain shower will definitely excite some travellers. Bathroom amenities were provided by THANN, one of the world's leading and most established skincare and spa product brand. It is not uncommon to see high-end spas (in Bangkok especially) utilising THANN products for their range of luxurious treatments. I really like the Aromatic Wood Aromatherapy Shampoo which is deeply moisturising (a huge plus for hotel shampoos) with a great woody scent. If you do not like bar soaps, liquid hand wash by THANN is also provided. Located on level 27, the Executive Lounge is open from 6am to 12am daily to registered guests. Since in-room internet is not inclusive in Singapore Marriott Tang Plaza Hotel's Executive Rooms, guests can access complimentary wireless internet access at the club lounge. More importantly, cocktail hour runs for four hours at the Singapore Marriott Hotel. Most luxury hotels have cocktail hours running for two hours so four hours at the Singapore Marriott Hotel is a huge plus. Cocktails (including beer and wine) are served from 5:30PM to 9:30PM with hors d’oeuvres and desserts being served at 5:30PM to 7:30PM and 7:30PM to 9:30PM respectively. If you wish to entertain your guests (who are not registered) at the Executive Lounge during these hours, S$45++ is chargeable for each guest (up to a maximum of two). When I got to the Executive Lounge at approximately 6:30PM, it was packed with business travellers (despite it being a weekend). This may be due to the fact that Gold and Platinum Marriott Rewards members get guaranteed lounge access regardless of the room type booked. These statuses are highly attainable with a US-issued credit card by Chase and since most of the business travellers present that night were Americans, I am quite inclined to believe that my hypothesis is accurate. While the lounge staff were great at refilling my drinks and clearing my plates, they did not initiate to help wandering guests look for a table when they stumble into this really busy Executive Lounge. I experienced a similar scenario once at the InterContinental Singapore but the lounge staff there were extremely proactive in helping you find a place to seat. The variety of hot food selection was decent so I will definitely recommend you go to the lounge early from 5:30PM to get a good seat (by the window of course) so you do not have to deal with any potential shortage of tables. I did however find the dessert selection from 7:30PM to 9:30PM limited and not nearly half as good. In fact, I should have taken the hint when most business travellers headed out of the Executive Lounge at approximately 7:30PM. On another note, if you are here only for the drinks, consider coming after 7:30PM since cocktail hour will run for another two hours. Registered hotel guests staying in the Executive Rooms have complimentary continental breakfast at the Executive Lounge or like me, you can opt for a full buffet breakfast at the Marriott Cafe instead. Breakfast here runs from 6:00AM to 11:00AM so you do not have to worry about sleeping in a little on weekends. Surprisingly, it was not particularly crowded when I came down at 10:00AM. There is a nice selection of bread and freshly baked muffins if you do not adhere strictly to a gluten-free diet (how can we?!). In fact, all of these breads are baked in-house for optimal freshness and more importantly to conform to strict standards that the Singapore Marriott Hotel has. 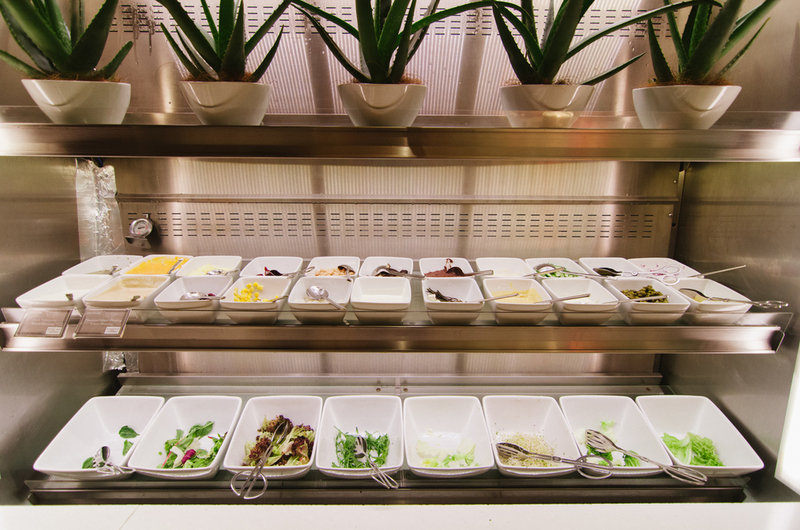 If you are up for something light, there is a rather extensive Salad bar where you can assemble your dream Salad. Throw in extra cold cuts or drop by the cheese counter to really enhance the pleasure of eating a bowl of salad. 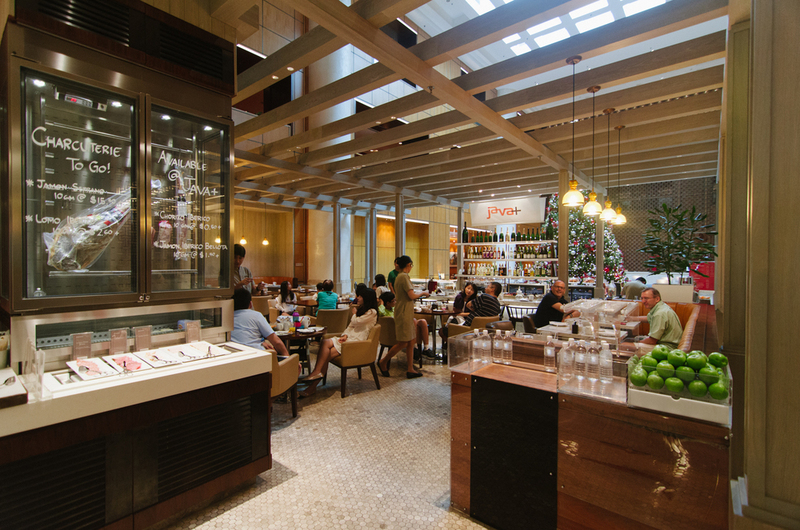 Otherwise, enjoy the wide selection of hot food items - you are at the Singapore Marriott Tang Plaza Hotel after all. There are a few items in a breakfast buffet that I will always eat - an omelette, hash browns, sausages and porridge. The omelette that I had at the Marriott Cafe was interesting. Sometimes, in order to churn out and fulfil customer orders quickly, omelettes are slightly undercooked. The one I had here was definitely cooked properly but yet, did not have the right amount of fluffiness to it. The hash browns that I had were amazing - golden brown and deep fried to perfection. I could not stop at just one. Sausages were pretty average and I prefer the ones that I have had at the Mandarin Oriental Singapore. I thought that the Asian dishes were pretty well executed and held true to the authentic taste that you can get outside. Like the Grand Hyatt Singapore, I was given a bill at the end of breakfast (despite having a breakfast-inclusive rate). Although I did technically charge breakfast to the room, I did not actually have to pay for it upon checking-out. If you happen to be a loyal Marriott Rewards Club member, the Singapore Marriott Tang Plaza Hotel is a Category 8 Hotel which requires 35,000 points on PointSavers and 40,000 points for a regular redemption. With the base earning rate at 10 Marriott Points per US$1, I wouldn't say 40,000 points a night here is amazing value. You are definitely better off paying the cash rate and saving these points for a more aspirational destination. The Executive Room that I stayed in is S$515++ under a Weekend Rate which is only applicable for arrival on Friday or Saturday. Deluxe Rooms (similar to Executive Rooms without lounge access) starts from S$380++ under the same Weekend Rate. Pay just S$1++ per adult for breakfast if you book the Weekend Rate. At approximately S$606 nett after taxes, the Executive Room definitely does not come in cheap. This is a great hotel to stay in if you have got Gold or Platinum status with the rewards program (I have Silver and it does absolutely nothing for me). The four-hours long cocktail hour in the Executive Lounge is a really nice touch especially for business travellers who wish to host their partners or guests over at a nominal fee. The rooms are well-appointed and have just gone through a thorough refurbishment. That being said, I personally think that the S$515++ cost is not really justified if you are looking for a staycation destination. The overall atmosphere of the Singapore Marriott Tang Plaza Hotel is very corporate and if you look beyond the excellent location (which is great for those who shop) and beautiful facilities, the room itself does not warrant a high price like that. Complimentary in-room WiFi should have also been included with the Executive Room. However, complimentary WiFi is coming soon for Marriott Rewards members from 15 January 2015.